bebopified: An open and shut case? Writing for the Chicago Jazz Music Examiner, Neil Tesser notes that 1) Club Blujazz in Wicker Park is musician-owned and operated (by jazz guitarist/vocalist Greg Pasenko and his wife, jazz violinist Diane Delin), 2) the bar (and its noises) are located in the kitchen, 3) the club actually has a kitchen, and a light but varied menu, 4) it is being positioned as a listening room (complete with 6-foot grand piano and B-3 on the premises), not a talking room, and 5) Sunday-Thursday will feature mostly Chicago musicians, the weekends mostly national/international artists. I went online to look at the schedule. Fred Hersch, Ingrid Jensen, and the Moutin Reunion Quartet in April. Joe Locke and Denny Zeitlin (with Buster Williams and Matt Wilson) in June. Time to plan a trip to Chicago. Photo from the Chicago Jazz Examiner. 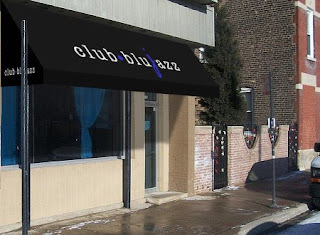 Today (July 1) Tesser reported that "Blujazz...has closed its doors, at least temporarily," with no timetable for plans to reopen.